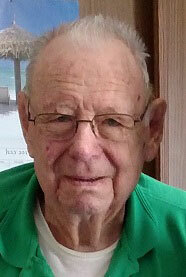 Tag Archive | "Kent City American Legion"
Donald L. Kelley, 89, of Cedar Springs, died Tuesday, March 22, 2016 at Spectrum Health – Butterworth Campus. Mr. Kelley was born September 30, 1926 in Laura, Illinois, the son of Henry and Estelle (Emerson) Kelley. He was a veteran of World War II and the Korean War and retired from the Army in 1968 after 23 ½ years of service. He was a member of the Moose Lodge #50 and the Kent City American Legion. He was an avid golfer and fisherman and always enjoyed a beer with the boys. Surviving are his wife of 63 years, Caroline; son, Roger of Broomfield, Colorado, sister, Lois Kneer of Florida. He was preceded in death by two sons, Kelvin and Patrick; stepson, Paul Curry; brother, Lester; sisters, Margaret and Myrna. Cremation has taken place and there will be no services.